Monitoring birds' timing of breeding and nest outcome is relatively easy, especially in nest box populations like I am involved with. Regular box inspections enable accurate calculation of when first eggs are laid, clutch size, the condition of nestlings at fledging and the number that fledge. Across the UK many thousands of nests in boxes are monitored annually. Monitoring invertebrates is less easy and relatively few people do this, and fewer still do so alongside detailed studies of breeding birds. But it is possible to estimate how invertebrate abundance changes during the breeding season using pretty simple techniques. The project I am involved in, with Ken Smith (now retired form the RSPB) and the universities of Edinburgh and Exeter, is interested in invertebrate abundance and how this changes during the course of spring, and how availability and timing varies spatially across the UK and between years. To achieve this we are encouraging citizen scientists who already monitor woodland breeding birds to additionally monitor invertebrates. Linking bird and invertebrate data gets 'bird people' thinking beyond just birds and participating and contributing to very worthwhile and important research. 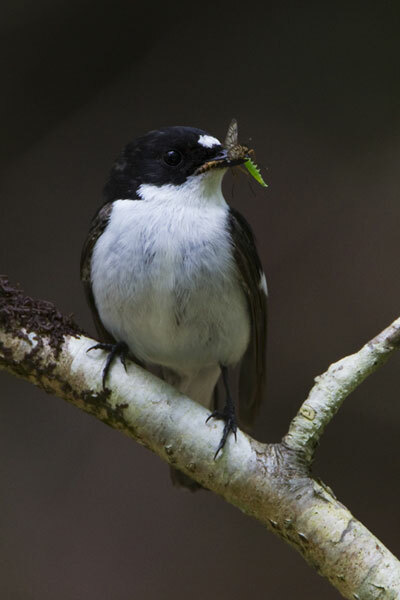 ...continue reading "Woodland birds response to climatic change: part 2"
The RSPB is investigating the impacts of climate change on the breeding success of woodland birds including the declining Pied Flycatcher. The onset of spring is getting earlier. Understanding the effects of this on woodland phenology and on the breeding success of woodland birds is being investigated across northern Europe, including in the UK. We know that our climate is rapidly changing, whatever its cause might be. One consequence of a changing climate, throughout northern Europe, is that the onset of spring has advanced - spring conditions occur earlier now than it did only a few decades ago. Spring is a very important time for many birds, plants and animals. Deciduous trees and many annual plants need to make the most of the short growing season and a huge variety of insects emerges that eats this new growth. Most birds breed in spring to take advantage of the super abundance of insect food available at this time. So how are they adapting to a changing spring? ...continue reading "Woodland birds’ response to climatic change"